What is filo pastry? 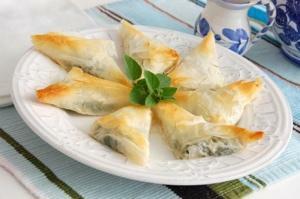 Also known as phyllo and fillo, filo pastry is a thin sheet of pastry used in Middle Eastern cooking. It is used in both sweet and savory dishes, and is notable for its flakiness. Can I Make My Own Filo Pastry? Sift together the flour and the salt into a bowl. Add the warm water gradually - stirring to form a stiff dough. Place dough on a pastry cloth. Measure out the olive oil, putting some on your hands. Knead the dough, incorporating more of the oil in as the dough starts to stick. Knead until you have a smooth, elastic ball of dough and almost all of the oil has been incorporated. Roll the dough in the remaining oil to coat the entire ball. Place the dough in a clean bowl and cover with a clean cloth. Allow the dough to rest for two hours in a warm spot. The dough can be stretched by hand (an extremely complex process) or rolled through a pasta machine using the manufacturer's instructions for rolling pasta. Using a pasta machine is much quicker and easier. The finished dough should be thin like tissue paper. How Good Is the Premade Frozen Filo Dough? Frozen filo dough is convenient and much easier to use than having to make your own dough as outlined above. The frozen filo dough that can be purchased in the freezer section of your grocery store is quite good and far less difficult to work with than homemade. Thaw the frozen pastry in the refrigerator overnight. The pastry should not be thawed on the counter or in the microwave. Lay parchment paper on the countertop. Unroll the filo onto the parchment. Place another layer of parchment on top. Repeat steps, stacking philo and parchment until all sheets are unrolled. Place parchment on top of the final piece of filo. Cover the parchment with a damp towel in order to prevent the pastry from drying out while you are working with it. Melt some butter in the microwave. Remove one piece of pastry from the stack and place on a piece of parchment. Be sure to recover the remaining filo with a damp towel. Using a pastry brush, paint some melted butter on top of the sheet of filo, covering the entire sheet. Remove another piece of filo and place it on top of the previous piece. Paint with butter. Stack three or four layers of filo sheets in this manner in order to create a layered, flaky pastry. Once you have a layered stack of filo, it can be cut into smaller pieces for appetizers, layered with fillings, used to wrap around ingredients or whatever the recipe calls for. What is Filo Pastry Used For? Many people wonder what is filo pastry used for? It can be used in a number of sweet and savory recipes, including Mediterranean cooking. It can also used as a substitute for puff pastry in some recipes. Some Mediterranean uses of filo pastry include backlava, a delicious Middle Eastern dessert of layered filo, honey, walnuts (or pine nuts); and spanakopita, which is filo wrapped around spinach, onions and goat cheese. Many western dishes also make use of filo. For instance, Beef Wellington is often made with filo dough in place of the puff pastry. Filo is also an excellent wrapping for chicken and mushrooms, and makes terrific individual bite-sized appetizers. Filo is delicious wrapped around a number of delicious fillings. Another use for filo pastry is to bake the pastry into cups and then fill them with sweet fillings such as berries and whipped cream. The uses for filo pastry are limited only by your imagination. This versatile dough, which can be purchased frozen, is a superstar in the kitchen, bringing an unexpected elegance to all kinds of recipes.